Check the bulletin board upon entering the campground for specific times and location of our events. Holiday weekend guests will receive an activity list with their reservation confirmation. Holiday weekend activity sheets will also be available in the registration office. Reserve early to get your favorite campsite. Please note: To help promote the "Green campaign" campers are encouraged to bring their own Table Service to the pot luck dinners. Please respect your neighbors - do not make unnecessary noise. Welcome to our 23nd Camping Season! Our 2019 Camping Season officially Opens! Stop in and say HI and join us for flavored coffee & pastries. Join the festivities! Egg coloring, Easter Egg Hunt, and a Ham Dinner Potluck Saturday evening. Meeting will be held at 4 PM Saturday with a "Seasonal Cash Drawing" & dinner to follow. Come Hear about the New "Seasonals Only" Challenge! Seasonal Campers are encouraged, ALL CAMPERS are welcome! Americus Area Community Coalition's Annual "All you can eat" Pancake Breakfast. Come up for Breakfast Saturday between 8 & 10:30 AM., then check out all the craft booths of regional crafters. (Don't forget, Mothers & Fathers day are right around the corner, you might just find that perfect "unique" gift! Time to start Pampering Mom! Come join us for our annual wine and cheese party, bring a bottle of wine to share Saturday evening. then join us for our Champagne Breakfast ($) Sunday morning. Moms eat free !! Time to get that Chili simmering and kick back and relax this weekend. Who will get the 1st Throphy this year? evening to compete. WHO will walk away with the Trophy? Come Hungry, there will be a lot of chili to sample & eat ! 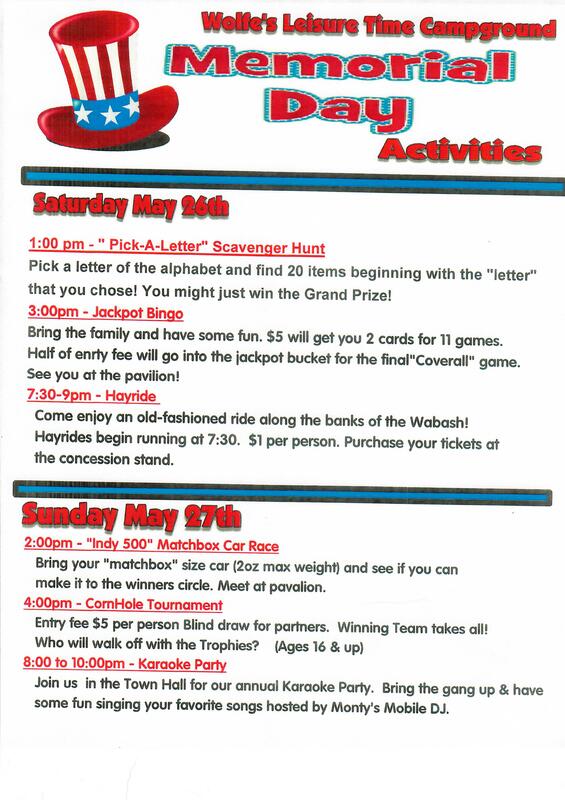 Bring the family camping and go on a "Flag Hunt" Saturday afternoon, then come to the Town Hall Saturday evening for a "Dessert Party" & "Penny Bingo"
Can YOU accomplish the challenge in these skillful games? Come give it a try! You might just be the Grand Prize Winner! Biscuits & gravy($) Dad's get their first bowl "Free"! Cool off with a "Lemonade Slushi" in a WLTC Souvenir Cup ($) & try your luck at the "Ice Cube Game"! Then we'll take the "chill" off around the community campfire Saturday evening roasting marshmallows & enjoying some great campfire tunes performed by Guitarist John Stevens! Give the wheel a spin! .... (1 Spin per campsite) Join in on the Wheel of Fortune Tournament. Who will walk away with the Trophy? Visit the WLTC Malt Shop for an old-fashion hamburger & malt. Then join us Saturday evening for a "Rock-N-Roll" party. Come enjoy some classic tunes to get you rockin!! How many items can you locate? Snap a picture and receive a raffle ticket for each item you find. Corn on the Cob! Please bring a picnic dish to share. Calling all Square Dancers, It's time to Do-Si-Do. Create your own Ice Cream Sundae ($) Saturday afternoon then join us Saturday evening for the "Square Dance" hosted by Lafayette Fun Squares..... Everyone is welcome! Calling All BINGO lovers This is YOUR weekend!! !12th Annual BINGO TOURNAMENT! It's time to celebrate "Everyone's" Birthday! Cake & Ice Cream and our FIRST "White Elephant Birthday Present Exchange"
some great Dancing Music. Be sure to sign up for the "Couples Dance Contest" Cash Prize! Stay in your "jammies" all weekend and relax! 14-15 Tailgaters Weekend - It's time for football!! Feast of the Hunters Moon Tickets will be available here at the Advanced ticket purchase price. Help us cheer Purdue to a Homecoming Victory. Join us for a "Crock Pot" Pot Luck Saturday Evening followed by our annual "Trivia Contest". Get ready for a Ghoulish Good Time!! Pumpkin carving, trick-or-Treating, Spaghetti Dinner ($), Costume Party & Karaoke! Come say farewell to yet another great season of camping and good friends. Steak Dinner ($$) with all the extras! Salad Bar, Rolls, Baked Potatoes and Dessert. YUM! Open for overnight, weekly & monthly camping throughout the winter. Lets have a Howling Good Time! Campers are encouraged to bring their own Table Service to the pot luck dinners. Activities subject to change or may be canceled at Wolfe's Leisure Time Campground discretion. Outdoor activities are subject to weather conditions. You are visitor number to our events page this year.